I've been using HttpClient wrong for years and it finally came back to bite me. My site was unstable and my clients furious, with a simple fix performance improved greatly and the instability disapeared. At the same time I actually improved the performance of the application through more efficient socket usage. Microservices can be a bear to deal with. As more services are added and monoliths are broken down there tends to be more communication paths between services. There are many options for communicating, but HTTP is an ever popular option. If the microservies are built in C# or any .NET language then chances are you've made use of HttpClient. I know I did. The using statement is a C# nicity for dealing with disposable objects. Once the using block is complete then the disposable object, in this case HttpClient, goes out of scope and is disposed. The dispose method is called and whatever resources are in use are cleaned up. This is a very typical pattern in .NET and we use it for everything from database connections to stream writers. Really any object which has external resources that must be clean up uses the IDisposable interface. As a rule, when you use an IDisposable object, you should declare and instantiate it in a using statement. 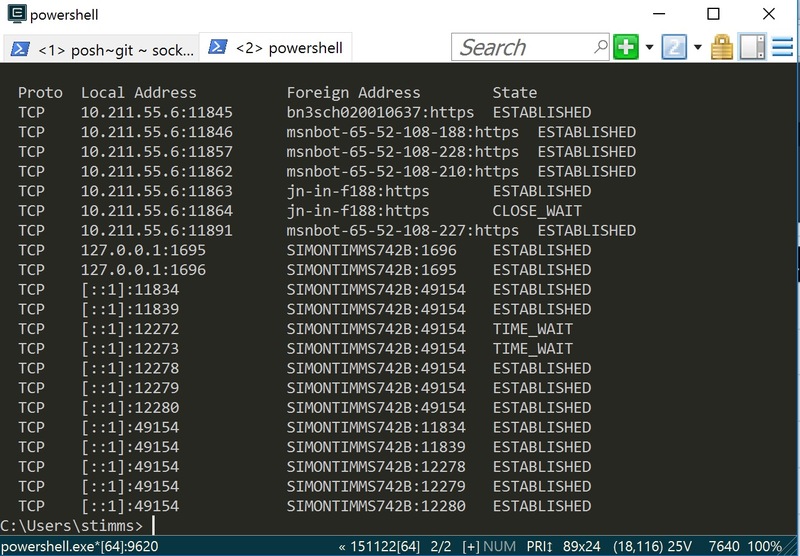 Secondly, all code you may have seen since...the inception of HttpClient would have told you to use a using statement block, including recent docs on the ASP.NET site itself. The internet is generally in agreement as well. But HttpClient is different. Although it implements the IDisposable interface it is actually a shared object. This means that under the covers it is reentrant and thread safe. Instead of creating a new instance of HttpClient for each execution you should share a single instance of HttpClient for the entire lifetime of the application. Let's look at why. Huh, that's weird...the application has exited and yet there are still a bunch of these connections open to the Azure machine which hosts the ASP.NET Monsters website. They are in the TIME_WAIT state which means that the connection has been closed on one side (ours) but we're still waiting to see if any additional packets come in on it because they might have been delayed on the network somewhere. 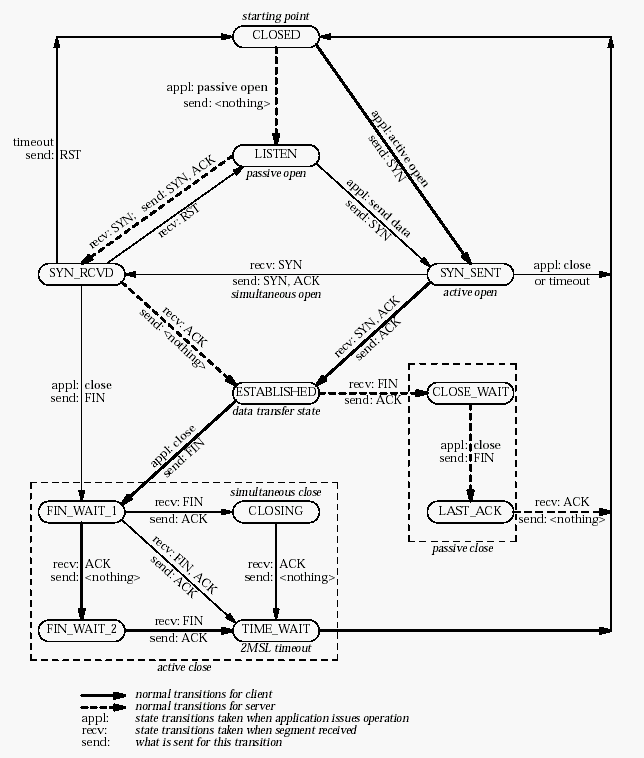 Here is a diagram of TCP/IP states I stole from https://www4.cs.fau.de/Projects/JX/Projects/TCP/tcpstate.html. Searching for that in the Googles will give you some terrible advice about decreasing the connection timeout. In fact, decreasing the timeout can lead to other detrimental consequences when applications that properly use HttpClient or similar constructs are run on the server. We need to understand what "properly" means and fix the underlying problem instead of tinkering with machine level variables. I really must thank Harald S. Ulrksen and Darrel Miller for pointing me to The Patterns and Practices documents on this. 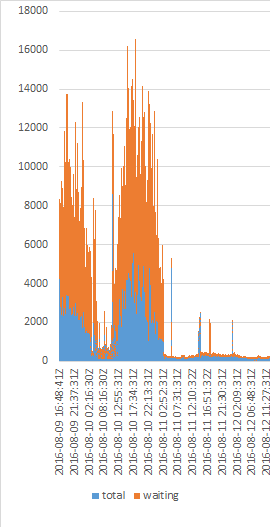 In the production scenario I had the number of sockets was averaging around 4000, and at peak would exceed 5000, effectively crushing the available resources on the server, which then caused services to fall over. After implementing the change, the sockets in use dropped from an average of more than 4000 to being consistently less than 400, and usually around 100. This is a chunk of a graph from our monitoring tools and shows what happened after we deployed a limited proof of the fix to a select number of microservices. Do not dispose of or wrap your HttpClient in a using unless you explicitly are looking for a particular behaviour (such as causing your services to fail).